Galway’s Barry Daly played a captain’s role, produced 0 - 3 from play, and won the Man of the Match to help his side to qualify for the All-Ireland final. Last September the Galway u-21s were ruthlessly mown down by a powerful Tipperary outfit that claimed All-Ireland honours at Semple Stadium. Thankfully it was a different scéal last Saturday evening at the same venue as Anthony Cunningham’s charges produced a terrific display of powerful hurling and real guts to see off a highly-rated Limerick outfit and qualify for another Bord Gáis Energy All-Ireland u-21 Championship decider. This memorable victory was achieved in admirable fashion, coping with the late minute dismissal of wing-back Rory Fox, the concession of two goals to Limerick’s brilliant attacker Shane Dowling at key junctures, and then the late barrage of pressure as Limerick pounded the maroon defence. Galway survived all that and in the process proved there is plenty of spirit, mental resilience, and fine hurlers on this u-21 Galway hurling squad. Team captain Barry Daly had a superbly productive evening, hitting 0-3 from play and using his mobility and work-rate to good effect at wing-forward and midfield. 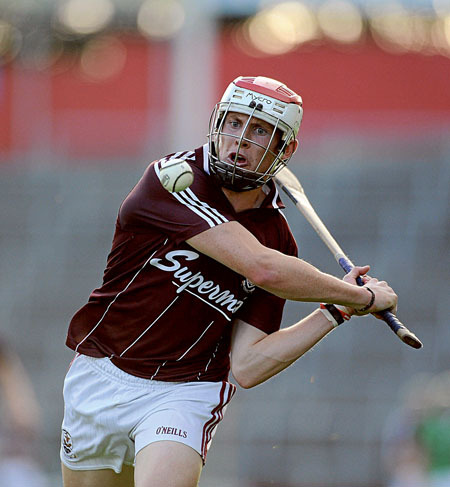 Centre-forward Niall Burke, one of the stars of Galway’s All-Ireland minor success in 2009, had a memorable game, shooting seven points from play. His strike accuracy and aerial prowess was central to Galway’s win and team manager Anthony Cunningham was rightly effusive in his praise for the Oranmore-Maree youngster. "Niall Burke had a terrific game all through. He’s a very good player, is underage next year and has a bright future. We need to keep developing these players and that is thanks to Mattie Ryan with the coaching he has done with these guys through the summer. That’s what Galway hurling needs, a lot of development." Full back Niall Donoghue had a terrific game too. He was solid under the dropping ball, strong in the tackle, and read the game brilliantly. He was ably assisted by Paul Gordon at number six. Tadhg Haran enjoyed a sparkling opening-half and shot 0-7 over the hour, with two coming from play, while senior star David Burke was excellent. After the fireworks of an epic Munster final win over Cork, Limerick entered last Saturday’s game looking to build on their momentum. But they could never quite scale those heights. The absence of Cathal McNamara hit their half-back line hard, while Kevin Downes, with a broken bone in his hand, was withdrawn before the break. They spurned a few crucial opportunities during the second-half and never managed to build on Dowling’s second goal when he rammed home a 39th minute penalty. They trailed by three points with eight minutes left when Mark Carmody failed to control a Dowling cross and that was their best chance to raise another green flag. Dowling did attempt to rifle a 30-yard free in injury-time through a cluster of defenders when a point might have been the better option and a possible chance of an equaliser from the puck-out. His manager Leo O’Connor backed the decision to go for a goal. "A lot of the decisions we make as a management team, we leave up to the players on the field. Shane Dowling fancied his chances from it. He had had a superb game of hurling tonight and was riding the crest of a wave at the time. Sometimes they don’t go in and that’s hurling." It was the exploits of Haran, Burke and Daly, who shot points of outstanding quality, that propelled Galway into a 0-14 to 1-9 half-time lead. Even when Limerick took the lead at 2-11 to 0-16 in the 44th minute, the clinical nature of Galway’s attack proved decisive. They shot five points in succession midway through the second-half - the pick of the bunch a beautiful effort from the side-line by substitute Bernard Burke. That scoring spree was pivotal to their progression to a final date with Dublin who hammered Antrim last Saturday. The All-Ireland u-21 final is fixed for 7pm on Saturday September 10 in Semple Stadium. Galway team that qualified for the 2011 All-Ireland u-21 final: J Ryan, D Connolly, N Donoghue, G O'Halloran, R Foy, P Gordan, J Grealish, J Coen, D Burke (0-1 ), C Cooney (0-1 ), N Burke (0-7 ), T Haran (0-7, 5fs ), J Regan (0-1 ), B Daly 0-3, D Glennon (0-1 ). Subs: B Burke (0-1 ) for Cooney (46 ), D Fox for Haran (58 ).